President Barack Obama and first lady Michelle Obama stand with Finnish President Sauli Niinisto his wife Jenni Haukio as they arrive at the North Portico of the White House in Washington, Friday, May 13, 2016, for a State Dinner. The president hosted the leaders of Sweden, Norway, Denmark, Finland and Iceland at the White House for a summit covering issues that included Islamic State terrorism, climate change and the Transatlantic Trade and Investment Partnership (T-TIP) deal. “We’re united in our concern about Russia’s growing aggressive military presence and posture in the Baltic/Nordic region,” Obama told reporters after multilateral talks. 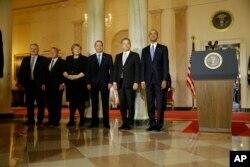 President Barack Obama stands with, from left, Iceland's PM Sigurdur Ingi Johannsson, Denmark's PM Lars Lokke Rasmussen, Norwegian PM Erna Solberg, Sweden's PM Stefan Lofven and Finnish President Sauli Niinisto at the outset of the Nordic summit. The NATO alliance is expected to announce the deployment of a multinational force to Baltic states and Poland during a July NATO summit in Warsaw. Tensions have been rising since Russia’s 2014 annexation of Crimea, support for pro-separatist rebels in eastern Ukraine, and ongoing violations of the Minsk agreements, which aim to de-escalate the conflict. Since then, the NATO alliance and Russia have bolstered their military presence and activities in the region, and the rhetoric between Russia and the West has also escalated. In March, Russia’s ambassador to Denmark said the NATO country could be targeted by nuclear missiles if it joined the alliance’s anti-missile shield. In April, U.S. and European Union officials accused Russia of conducting aggressive and unsafe military maneuvers over international waters in the region. Moscow denied the claim. Also last month, Russian Foreign Minister Sergei Lavrov warned Sweden not to join NATO, saying that if it did side with the alliance, Moscow would “take necessary measures.” Sweden has had a long-standing policy of remaining neutral in armed conflicts. The U.S.-Nordic summit came one day after the U.S. anti-missile defense system in Romania, aimed at protecting NATO members, became operational. The move infuriated Moscow, despite assurances from Washington that Russia is not a target. 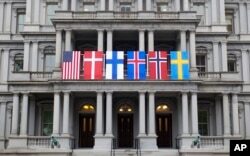 In preparation for the visit of Nordic leaders to the White House, flags are displayed on the Eisenhower Executive Office Building on the White House complex in Washington, May 12, 2016. “At times when basic rules and norms of international standards are contested, we stand side by side to defend them,” Löfven said. “We will not recognize the illegal annexation of Crimea or accept Russian aggression in Ukraine." Obama hailed the Nordic countries for their global cooperation and contributions, saying they “consistently punch above their weight.” But they are reluctantly being pulled into the standoff between Russia and the West, said one analyst. “They are very uncomfortable because they all desire a more healthy and positive partnership with Russia, but over the last two years [Russian President Vladimir] Putin has changed his relationship with the West,” said Jorge Benitez, director of NATOSource and senior fellow of the Brent Scowcroft Center on International Security at the Atlantic Council. “He [Putin] has chosen to use military force against his neighbors. He has chosen to do a lot of more aggressive intelligence, information warfare and political coercion against them. So they have had to reassess how they are going to react to Russia,” Benitez said. Finnish President Sauli Niinistö called for strengthening security and stability in the Baltic Sea and northern Europe, including “appropriate dialogue with Russia to enhance transparency and reduce risks,” adding that Nordic countries are security providers for the region, Europe and the world. In a joint statement following the summit, the leaders committed to strengthening investments in defense and military capabilities, as well as in diplomacy and regional cooperation to enhance European security. They also agreed to contribute and cooperate more on issues like migration and refugees, climate change, energy, safeguarding the Arctic, the economy, trade, development and humanitarian assistance.